The General Data Protection Regulation (the “Regulation” or “GDPR”) will be enforceable as of May 25, 2018. The Regulation aims to strengthen the rights of European Union residents with regard to their personal data. This document is based on the Guide for Processors published by the CNIL and on the Regulation. Both the client and the translator are strongly advised to read the Regulation since failure to comply with it can result in heavy fines. Which Translation Projects Fall Within the Scope of the GDPR? To determine whether a translation project involves the processing of personal data covered by the Regulation, we must look at the content of the file to translate. Does it contain personal data of natural persons living in a European Union Member State? If the answer is “yes,” the Regulation is applicable regardless of where the client or the translator is based. The answer to this question is not always obvious. For example, sometimes the client has a document translated because they do not know the language. In such a case, it is best to exercise caution and take all required security measures when sending the document to the translator. Please also note the Regulation is marked as a “text with EEA relevance.” You should therefore check the EFTA’s website for the progress of its integration into the EEA Agreement by Iceland, Liechtenstein and Norway. These documents would fall under the GDPR if the persons mentioned in the document are natural persons living within the European Union and the document makes it possible to identify them. The client, i.e. the individual or entity who orders the translation services and sub-contracts a translation project to a translator, instructs the translator to translate the documentation and thus assumes the role of controller under Article 4 of the Regulation. The translator becomes a processor under Article 4 of the Regulation by translating the documentation based on his or her client’s instructions. If the translator hires a sub-contractor (reviewer, other linguist, designer, etc. ), the sub-contractor becomes a sub-processor and has the same obligations as the translator. 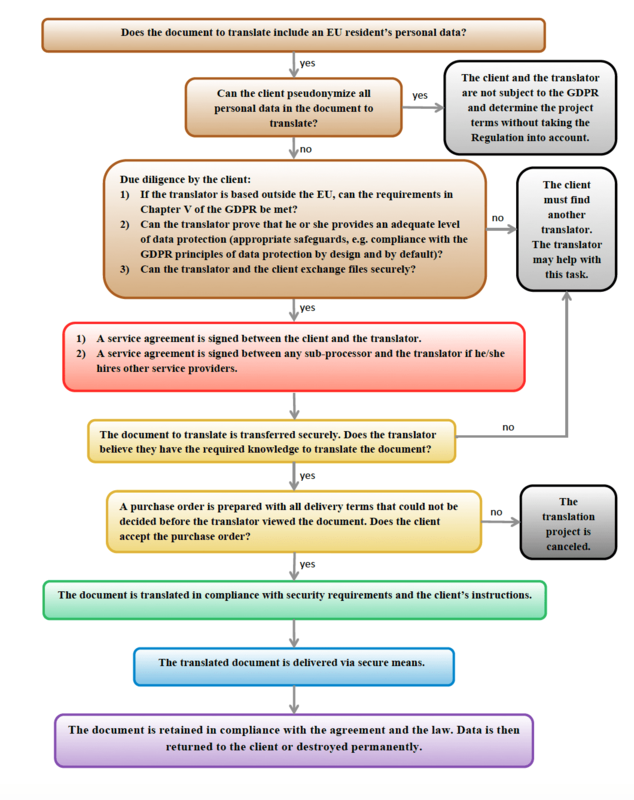 The diagram (click to enlarge) provides a set of guidelines for implementing translation projects that involve the processing of personal data under the GDPR. The table in the next section summarizes the client’s and the translator’s respective responsibilities under the Regulation at each step of the translation project. A color code is used to provide an easy cross- reference between both sections. Determine whether the document to translate includes an EU resident’s personal data. Determine whether processing is lawful under the GDPR (Articles 5 and 6 of the Regulation). Evaluate a pseudonymization process to hide all personal data. If the translator is based in a non-EU country, check whether that country has been determined as ensuring an adequate level of protection by the European Commission or whether another “appropriate safeguard” must be in place. Carry out due diligence on the potential translator to determine whether he or she provides an adequate level of data protection (appropriate safeguards, i.e. compliance with the GDPR principles of data protection by design and by default). Agree with the translator on which encryption methods to use to send the file to translate. Ask the client whether the document to translate contains an EU resident’s personal data. Obtain confirmation from the client that the translation is lawful and fulfills one of the requirements of Article 6 (1) of the Regulation. Prove to the client that the translator is compliant with the principles of data protection by design and by default; the translator delivers his or her security plan (ISO/IEC 27001:2013 or NIST) and security policy (and indicates who will have access to the file to translate). Evaluate whether the translation project requires sub-contracting (e.g. reviewer, other linguist, designer, etc.) and, if so, in which country, and obtain the client’s approval. 1)	Draft a service agreement between the client and the translator that includes their obligations (see section below “Mandatory Clauses in the Service Agreement Between the Client and the Translator”) or make sure the translation is governed by another legal act (see Article 28 of the GDPR). If the translator is based in a non-EU country and the European Commission has not issued an adequacy decision for that country, put in place an “appropriate safeguard”. Determine a procedure to follow if, after seeing the file, the translator finds that he or she does not have the knowledge to translate it. Tell the client immediately if the instructions violate the Regulation. Comply with the principle of data protection by design: give the translator only the data that requires translation. Transfer the file via secure means (data encryption). Store the file in a secure place. Confirm if the project will be handled and prepare a purchase order with all delivery terms that could not be decided when the translator had not yet seen the file. Ensure that the translator follows the instructions. Translate the file with the utmost confidentiality and security (physical and logical access controls, backups, traceability, encryption, pseudonymization/anonymization). Ensure that sub-contractors undertake the translator’s obligations as their own (by signing a new sub-processing agreement stating the sub-contractor’s obligations under the Regulation). Securely transfer the file to the sub-contractor(s). Ensure that all sub-contractors store the file in a safe place. Retain the translation according to the client’s contractual and legal requirements. Retain the translation according to the translator’s contractual and legal requirements. At the end of the retention period: return the data to the client or destroy the data permanently. Support the client if the EU resident identifiable/identified in the file decides to exercise his or her rights under the GDPR. Support the client to fulfill his or her own obligations. Provide all evidence that demonstrates the translator’s compliance with the GDPR and enables the client to conduct audits. Assume full responsibility toward the client if the sub-contractor does not fulfill his or her obligations. Impose a non-disclosure obligation on people who work with the translator. Notify the client of any data breach (such as a cyberattack or a loss of computers or mobile devices that contain the data). Designate a representative in the EU if the translator is not based in the EU unless Article 27 (2) of the Regulation applies to the translator. Ensure that the translator complies with the Regulation. Monitor the translation project, which includes conducting audits and inspections of the translator. Complying with the General Data Protection Regulation when undertaking a translation project can be difficult due to the number of participants in the translation cycle. Compliance with the Regulation can only be ensured if all sub-contractors comply with it (all translation agency employees and/or all freelance translators and their reviewers, designers, etc.). Regardless of the number of participants, every project subject to the GDPR will require good communication between the client and their translator. Successful delivery will truly be a team effort where every participant has a role to play. The GDPR is and will be a continuously evolving topic (e.g. adequacy decision concerning the EU-US Privacy Shield). Readers are therefore encouraged to deepen their knowledge of the Regulation. For further reading, please consider the websites of the EU countries’ supervisory authorities, as well as the Article 29 Working Party’s website for guidelines on the Regulation. (f)	processing is necessary for the purposes of the legitimate interests pursued by the controller or by a third party, except where such interests are overridden by the interests or fundamental rights and freedoms of the data subject which require protection of personal data, in particular where the data subject is a child. translorial posted this article under Business Tools, Translation, Worthy of a Visit	on Tuesday, May 8th, 2018 at 1:25 am	You can follow any responses to this entry through the RSS 2.0 feed. You can leave a comment or trackback from your own site. I would like to see/hear how an individual freelance translator located in North America realistically can comply with all this nitpicky details. The contractual obligations alone may require thousands of dollars in legal and other consulting fees, something really no freelancer can afford to do. It would be nice of translation associations, like the ATA, NCTA, or PEN, etc., were to offer comprehensive, actionable sets of model contracts and concrete suggestions for workflows for free to members. Timo, I agree that it would be nice if a translators association published some guidance. However, NCTA as a small-ish local ATA Chapter does not have the resources to do so. NCTA relies on volunteers such as Monique Longton for contributions such as the above. I informally inquired about the GDPR with ATA, so ATA is definitely aware of the new regulation. That said, I am specifically looking to the local/national translators associations in Europe, who are directly affected and whose members are all affected, and while some of them offer seminars and webinars on the topic, none of them seem to have published any such guidelines (please correct me if I’m wrong). I’m not sure I can expect ATA to publish any guidelines from afar, especially since only a portion of ATA’s membership is affected, as opposed to translators associations situated in the EU. Secondly, many translation projects do not (or should not) include data that fall under the GDPR. Marketing material, user guides, financial reports, patents, etc. etc., while certainly (highly) confidential, do not contain personal data and therefore do not fall under the GDPR. Then, as Monique pointed out above, for other documents, such as HR documents or clinical studies etc., it is the client’s obligation to anonymize/pseudonymize the data, since they are not needed for the translation. And for the remaining translation projects, Monique gives a pretty good summary of the workflow above, IMHO.